These guidelines fore guestplayers is made by Skybird05 as a help fore new players joining a multiplayer game and are some very important advise making a good and joyfull multiplayer experience when you fore the first time enter a multiplayer game. Etiquette for GUEST players - Read before entering the demo for the first time! This is for GUEST players primarily. They should read this before entering their first session. I play the game since a longer time, and in the imminent past have hosted several sessions open to guest players. At that opportunity I was confronted with the same questions time and again, because people have not read sufficient manuals and tips and jumped into the session even unprepared. And most of them then left quickly, disappointed – and necessarily so. This is meant as an Instant Start Aid for GUEST players. Not a Guide or Manual – an Aid. It does not relieve you from the need to read the basic material from the wiki and the manual, but it should help you to get prepared better for your first test session of the game. Also, it should help to avoid conflicts with other players, of which there have been quite a few, I must say. Your guest status allows you to visit and watch all reserves in open MP sessions that allow guests, however, you are allowed to shoot-for-score just one species: Muledeer. And this species lives on Logger's Point only. If you want to shoot for score, there is no point for you to visit other reserves than Logger’s Point. Other species there you cannot score on. In other reserves you cannot score at all. So, guests indeed should focus on Logger’s Point. The game so far gets delusively advertised as “free to play”. It is not really. The free content above is very limited in scope. In theory you can also shoot rabbits, but the ammo making such scores legal, you already need to pay for, so it is not really “free”. Better think of the option of free access as a guest as a DEMO version of the game. That’s what it is, and that is what the publisher should call it. There is the issue of lacking etiquette with many players busting into MP sessions. No greeting, no short “Hi” or “Hello”, but when they leave maybe a “***?” before they shoot into the air to spoil it for others, and then logging off. I have seen it many times. Not nice. It’s the reason why many members do lock their sessions for guests. I like to run both locked and unlocked sessions. But I want guests to behave, and that is non-negotiable. They must not talk a lot when they do not want to, no – but I insist on minimum politeness and manners, and falling in line with the needs of the gameplay. When you are new, and have questions, you want something from me, or other session hosts. Maybe it is a good idea then to try friendly approaches first, before starting to launch hot emotions!? It is very important you get familiar with your keyboard commands. Basic things like game controls are a knowledge that you should consider as >essential<. Now to the ingame stuff. The golden rule is: behave like you would do in real nature when hoping to hunt down something. And understand that this is no action-shooter. While the game simplifies many things, and the density of animals around you already is fundamentally increased compared to reality, you nevertheless should not expect to meet an animal behind every seventh tree. I have had 4 hour matches with two dozen kills. On other days I played one hour and saw nothing, and ended a session with just one kill – or none. Could happen. The one question by which guests really have learned to kill my nerves, is this: “Where can I QUICKLY find an animal to shoot at?”. Brrr! Wrong game for you, buddy. Learn PATIENCE. Or play another game. There are four movement speeds. Running you almost never should, it spooks animals at great distances. Rain dampens the noise a bit, but you cannot hear well and run straight into animals yourself. I often sit still when it rains! Also, after a loud shot of yours you can run for a short time, since all near animals were spooked by the shot anyway. But do so only for very short time. And if there is a need. As a host, newbies running around is the one thing that has best chances of me warning them, and warning them a second time maybe - but then kicking them when they start to spoil the hunt for others. It's a serious thing, really. Walking is okay if you are sure no animal is near. However, you are safer when moving in a crouched stance. It is slower, yes, but also more silent. I spend at least as much time in game moving in crouched stance, like I spend in walking. Laying flat on the ground hides you best, but makes you very slow, in high grass your sight is hindered, and your head movement is limited if you use magnified views from scopes or binoculars. When you want to merge with players on the map, ask them first, and ask them for their preferred way of your approach, their intended own routes, so that you do not conflict with their intentions. Good method is to plan a point where you two will meet in mutual agreement, the one reaching it first will wait for the other. When you move over an elevation, crouch or lay down when reaching the top. Often it is better to walk around the top. When laying in grass, find a rock to lay on, or any other slightly elevated position, or a place with less grass. You then look over the grass. The one thing you need to understand is that things you can walk through (bushes, grass), will not hide you – they only block your eyesight, but you are still visible to the animals. Only solid objects you cannot walk through, block you from their sight. Animals beyond ca. 230 meters, will not be rendered anymore. But they are still there and get calculated in their movement and behavior. Therefore, you cannot shoot beyond that distance, too. Scent is important for tracking probabilites of animals. Therefore, wind direction is something to watch out for! By default, you are equipped with binoculars. They are there for a purpose. Can you imagine what purpose that is? Use them, this means. In darker woods, you cannot easily see animals without them. Do not call endlessly. You have a caller, yes, but that does not mean you need to constantly use it once a minute - it then will be counterproductive and spook animals. Use it when you know deer is near, and then once, and then wait before using it again. It may be different with callers for other species, but you do not have these, so this advice is what you should focus on: use self-restraint with the caller. Some guests love to endlessly whistle. I wonder why. Despite scaring pheasants, it is not really helpful, to put it this way. DO NOT WHISTLE. When shooting. Use the “hold breath” key! To further stabilize the rifle: laying is better than crouching, crouching is better than standing, standing is the most difficult way to shoot. Especially for you guests, who have no skill achievements improving your shooting. Therefore: get close, hold your breath, if possible: lay down. Forget long shots at 200+ m, standing. In German that is called “Rumballern”. Without hitting anything. Animals get spooked by shots from too close. 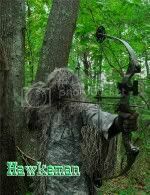 If you want to shoot, and another player is within lets say 600m, ask whether he is tracking or not – you may ruin his current hunt and spook his prey. Not kind behavior that is, it will not make you many friends, some hosts will kick you immediately. If two players are close to each other, they should communicate to time and synchronize their shots. If you do not play in pairs, but roam the wilderness on yourself, do not approach other players, but find a piece of land, a course, that keeps you out of acoustic conflicts with others. At least you could ask before approaching others. When moving close to others, say 400m or so, be silent. Do not move ahead of their course: you may run into the prey they are after. Surprisingly few players asked where to aim when they want to shoot. For deer, usually do not shoot at the head or neck - small targets that move a lot. From front, shoot at the chest and then quite low, the heart sits really low. From the side, aim at the front half of the body, the area around the shoulders, there are the lungs and you even have the chance for a double lung or combined lung-heart shot. These shots will drop the deer in place. If you injure it, it will run away, and spooking all animals around and those it meets in its path. No joy for you: long after-search. No joy for others: you may spook their target animals as well. Understand that animals have eating times, drinking times, and resting times when they are relatively inactive. These times vary for every species. Most deer sees a drop in activity around noon, 10:00 to 14:00 maybe. You can then find it sleeping, if you are approaching silently. Also understand that veteran players have better skill levels than you. That means they have better weapon skills, they can track at greater distances, see more tracks, and can get better and more precise information from their huntermates, they “hear” better and can identify ranges and directions better. If you follow a veteran player and you see him stopping, or checking or observing, he may got alarmed by something he noted which you still cannot note. So be patient, and do not spoil it for him. Also, keep some meters distance or so to your leader. I got often pushed by a guest out of my hiding, because he crawled into my neck and right under by T-Shirt at times! Tics may do that in real life. But are you a tic, my dear guest?! Well, that is the basic etiquette, I think. This does not replace the reading of the manuals, it just is meant to help guest players trying the demo (!) to interact better with their hosts without causing troubles or conflicts, and I hopefully managed to give a basic understanding of some key concepts of the game. BTW, if you enter “teams” while trying out the main menu, essentially the only thing you achieve by that is that you become invisible on the map for all others, you cannot be avoided or found by them anymore. Not useful! A few words on the pricing model, since it gets plenty of fire. The Hunter is not the cheapest of games, but for an online game it also is not the most expensive. However, you can make the game an extraordinarily expensive game by buying all stuff there is – BUT THAT IS ABSOLUTELY NOT NECESSARY !! In principle, you can already get along with one shotgun and three kinds of ammunition (slug, birdshot, buckshot) – you then can hunt all species in all reserves. More realistic is to count with two rifles of smaller and big caliber, one shotgun and a bow as minimum weapons. Not all calibers are allowed for all species, that is why. You can also specialize in bow hunting – arrows can be used on all species. Just one bow is enough to get full access to all what the game has to offer. The argument by some critics in the Steam forum complaining about how much the game costs when you buy all weapons, is pointless, and underhanded. Same is true with clothing. There is functional clothing that blocks visibility, scent and noise to varying degrees – or not, and it comes in variations for climate/season zones, and there is plenty of purely cosmetic stuff. You do not need most of that stuff, you can get along with very few things. Some of the equipment beyond that, is essential indeed, especially a set of callers you need. But again, many things are available that you do not need at all. The only thing where I share the criticism about the pricing model, is the hunting for waterfowl. The system stinks of trying to milk coins out of people, and honestly said, the experience of hunting geese and mallards is not the most impressive one in the game.I recommend to stay away from that as long as you do not feel real strong love for the game. My tip would be, for testing it: invest into a 3 months membership, that gives you all reserves and species, and then see how much more credits you need to get the callers, and some basic minimum weaponry (if it does not come with the membership: I entered The Hunter in 2012 via the special German DVD edition “2013 Deutsche Wälder”, so for me things were different). When buying equipment, watch out for the “packs” section in the shop, you can save money there, for example a set of callers instead of buying them individually. Do not buy ammo, you get it for free (three boxes, 30 arrows) for any weapon at the beginning of every session. All stuff you buy as guest or during membership is yours for lifetime. If you temporarily withdraw and have no membership after the current one ran out, and at a later time you come back to the game and log another time membership, all your former equipment you bought, will be there again. You do not need to buy your equipment twice. Good hunting to everybody, but please: don’t get lose with your rifle, always remember that there are other players out there as well, and try to not ruin it for others by noise, useless running around, or bad behavior. I’m a patient and welcoming host (though sometimes with a sense of black humour…), - but I have kicked some guests at times as well. Never try to kill the nerves of your hosts – their rifles are stronger than yours.